I was not surprised when the location that was announced for the next bird walk on Sunday, the 6th of November, 2016 turned out to be Uran, Navi Mumbai. Why? As mentioned in the previous blog, Uran had been particularly popular since the last couple of weeks, because of two species in particular. One was of course the Indian skimmer, an endangered tern species (usually restricted to freshwater habitats) that I had the fortune of seeing on the same day as the BPS Birdwalk. The other of course, was the bird I had gone to Uran in search of, the Caspian plover, a rare migrant which has only a handful of records in India. And it was not just these, there were reports of other rarities, the grasshopper warbler, Asian desert warbler and even bristled grassbird. No surprise then, that Uran was hot property! This walk was co-ordinated by Adesh Shivkar, Mandar Khadilkar, Avinash Bhagat, Clara Correia, Mayuresh Khatavkar, names for which the birding community needed no introductions, their collective birding and conservation experience, staggering to say the least. A testament to this is that as soon as the notification for the next bird walk was put up, the MBC team was swamped with registrations. Initially, the plan was to restrict group size to 30. However, since this was among the first bird walks, it was decided to increase this limit, and while the number of registration requests were still higher, over 80 participants finally ended up attending the bird walk. The plan would be to meet at the Dastan Faata at Jasai to bird for a little while near the marshes there, and then break up into smaller groups, gradually make our way to Panje village, where most of the sightings reports above had happened. Since there were going to be some political rallies near the Dadar/Sion area, I decided to drive there via the Santacruz-Chembur Link Road going through Mankhurd, Vashi and then to Navi Mumbai. Accompanying me were Vikrant Choursiya and Jyoti James. We reached Jasai at about 6:45 AM, and were surprised to already see a group of 30+ people in the marshes. With their scopes, binoculars and telephoto lenses, there was no question as to what tribe this group belonged. Parking the car close to the others, we stepped down into the boggy marshes. As we neared, we spotted Mayuresh, Adesh and several other birders with their binoculars and scopes trained to a bevy of wetland birds in the marshes. 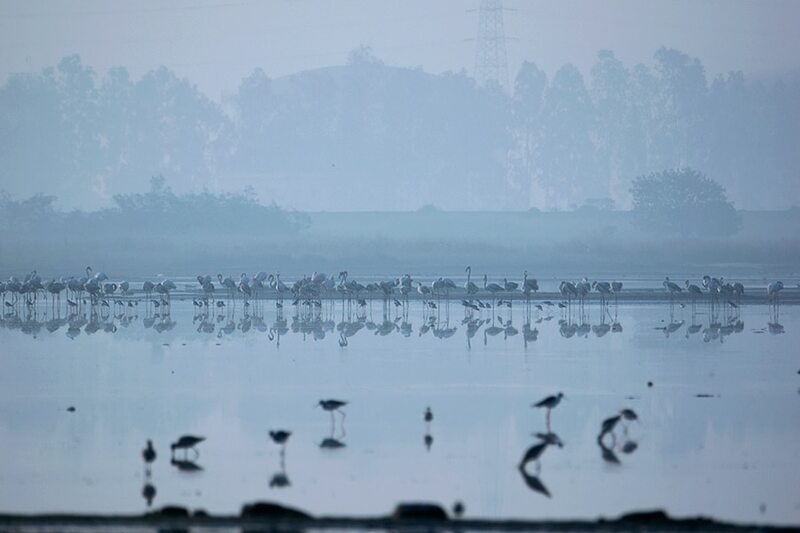 Front and centre, were a group of 200 odd Greater Flamingoes, composed mostly of immature individuals. Other numerous waders included black-tailed godwits, marsh sandpipers, glossy ibises, black-winged stilts, common redshanks and a host of waterfowl in the distance including ruddy shelducks, northern pintails, northern shovelers among many other species. As we watched them, more of our number joined us, and when the group had reached close to the expected size, Adesh gathered us all together, giving a quick orientation on the purpose of reviving the Mumbai Birdwatchers’ Club, stressing on building a community of like-minded people going forward. Following that were a quick round of introductions and it was interesting to give faces to the people many of us had enthusiastically discussed birding with on Whatsapp and Facebook groups. The introductions done, the birding continued. More interesting sightings took place, including raptors such as Western Marsh Harriers, and an Osprey as well. All this while, the co-ordinators took care to not only show different species, but also elaborate on their identification characters, behavior and migration patterns. Standing in the group close to Adesh, he talked about among other things, the separating characters of black-tailed and bar-tailed Godwits, the plainer back of the former (relatively more scaly in the Bar-tailed), as well as the propensity of the Bar-tailed Godwits to be seen largely in coastal habitats rather than freshwater ones. He also talked about the migration patterns of the bee-eaters, the blue-cheeked bee-eaters more as passage migrants seen in the Mumbai region around October/November, while the blue-tailed bee-eaters are seen typically from August/September, their numbers steadily rising with the onset of winter, and continue to be seen till around April. Additionally, Adesh kept us birders on our toes by focusing the scope on a particular species, and then asking us to identify it with characters. This was an enjoyable exercise as there is no better way than this to learn from seniors in the field. The species tested on included the common sandpiper (a diagnostic character being the white shoulder patch) and the lesser sand plover (characters include the smaller bill, grayish legs, and absence of any collar or eye-ring to separate from other small plovers). Likewise, I could see Mandar, Avinash, Clara and Mayuresh engaging other budding birders. After a good amount of birding, some of the groups decided to move to Panje. Avinash and Clara headed out with some of the smaller groups first and gradually the rest of us also got into our cars. Adesh decided we could also stop en route close to some reeds where we were likely to see some warbler activity. Unfortunately, once we reached the spot, the habitat was found to have been dried up and levelled. The Uran area has been in the eye of a storm since the past many years. With the airport coming in the vicinity and the Navi Mumbai Special Economic Zone, many of the wetland habitats hosting hundreds of resident and migratory species have been lost to endless construction of structures including roads and flyovers. Off and on, cases of poaching are also heard of here including of the famous flamingoes. Some dedicated birdwatchers and environmentalists have been fighting for years here for the conservation of the habitat and the avian residents, and continue to do so, in the face of ever increasing pressure on the land. Uran has been prolific in providing some amazing bird records over the years, testament to the diversity of the habitat, so documenting the avifauna here has become more important than ever before. Continuing with our journey, we slowly made our way to Panje, birding most of the way. Where the natural habitat was still preserved, we saw among many birds, the Siberian stonechat, Indian roller, scaly-breasted munias, rosy starlings. Avinash and others spotted a greater spotted eagle en route. A birding couple even saw a tawny eagle. On reaching Panje, once again we parked our car outside the access road, and proceeded to meet up with the others. Panje typically is a mix of woodland and wetland habitat and it was in the dried bed of the wetlands that the bird everyone was looking for, the Caspian plover had been seen. We walked along the trail, keenly scanning on our right to see the presence of any plover. I should mention here that after failing to sight the Caspian plover on my first visit, I had made another quick trip here prior to this bird walk to Uran with Saurabh, Amey and Prachi with the intention of sighting the plover. After much searching, Amey had spotted a group of three plovers facing us on his scope. He noticed the middle one was slightly larger and had buffish underparts, pointing out that this might be our elusive quarry. Taking a note of its position, we ventured closer but again couldn’t sight it, and it was only after much more intensive searching, we saw it at a closer distance and I was able to take a few record shots. Later while returning, the presence of a few fellow birders including Vinod, Mohak and Chirag close to the road indicated that the bird had come much closer and I got a second chance at photographing it. When birdwatchers first saw this individual, the identification was a challenge as the Caspian Plover (which is a rare migrant to the region) is not easily separable from the Oriental Plover which would be a vagrant (outside the species’ breeding and migration range) to the region. The white underwing (as opposed to dark in the oriental) which they observed in flight was a key character in helping identification. With this background, I knew finding this solitary bird over such a huge area was never going to be easy. Teams led by Adesh, Avinash, Clara, Mayuresh and Mandar scanned different parts of the area intensely, but to no avail. It was then decided to nevertheless continue with our regular birding rather than chasing after one bird. So we headed back to the narrow Dongri road that passed through Panje, planning to culminate our walk at the spot the Indian skimmer had been seen. The wetlands were absolutely chock full of birds. Huge numbers of waterfowl could be seen, and we even saw flocks of smaller waders further within. Accordingly, the scope was set up, and once again, we saw each species and discussed extensively about it. For example, we were lucky to see a few Eurasian wigeons and discussed its eclipse plumage (this is the drab form adopted by the males of a species outside the breeding season), and its identification characters such as the smaller, rounder head and grayish black-tipped bill. We also observed the wader flock seeing marsh sandpipers, common redshanks, ruffs, common greenshanks when Adesh announced that there was a spotted redshank in the group as well. We could manage a few glances of its bill (the base of the lower mandible of the bill was red, as opposed to both the upper and lower base being red in the common redshank) as well as its prominent supercilium (eyebrow). Finally, it was decided to call it a day. The entire group gathered where Adesh once again mentioned there would be regular bird walks in the next few weeks, the next one being planned for Bhopar in Dombivli led by Kiran Kadam and a few other birders. Almost like a parting gift, we were all treated to the dark morph of a booted eagle soaring high in the sky. The birding hotspots in Uran are spread out over a large area. There are a number of different habitats, inundated marshes, reed beds, freshwater bodies and their dried beds interspersed with woodland and grassland habitats as well, and may well be one of the major reasons the area sees a particularly high diversity of avifauna. One can start near the Jasai marshes (Location of Jasai marshes: https://goo.gl/9q0F2c) to begin with. Note that once you get down from the road to go into the marshes on your left, the surface is boggy, so it is recommended to wear good shoes or sandals, and would always be better to have some company in case you get stuck somewhere. From Jasai, when you head towards Panje, except for a short stretch on the highway, birding all along the route can be rewarding so it is recommended to drive slow here, keeping an eye out on the surrounding wetlands, grasslands and high-tension wires (We actually did see a common kestrel on our way back from Panje after the birdwalk, and the area is conducive to come across other falcon species as well from time to time). Once you near Panje (Location of Panje: https://goo.gl/yN4V7F), there is a small road down the slope towards the Dongri road. There is a wide expanse of wetlands here, both on the left and right worth exploring. A small dirt path on your right would take you further inside the wetlands, you can also choose to follow the Dongri road. The drier parts of the wetland are good areas to come across plovers, larks, pipits while the inundated parts see huge flocks of waders and waterfowl (wader concentrations are likely to be greater close to the hours of high tide when they would fly in here from the coast). Because the typical terrain is flat and spread out, having a scope is extremely useful here to expand the range of spotting species. Can u send me the whole programme cuming in next year? I thoroughly enjoy Birding with this group…. even a new birder gets to know everything about each specie we see. Hello, I will be visiting India for a month from late February to ate March. Apart from the cricket I intend to do some birdwatching. I am particularly interested in buying a copy of the book “Birds of the Indian subcontinent” Krys Kasmeirczac. I will be spending a few days at the start of my holiday in the Fort Area of Mumbai. I am wondering if your society would know any good book shops in this area where I might get a copy. The field guide by Krys Kazmierczak might be a bit difficult to get in bookstores as it is a little older. The most popular one here currently is the Grimmett and Inskipp ‘Birds of the Indian Subcontinent, Second Edition’ which you may find at some bookstores such as Strand bookstore at Fort or the Oxford bookstore at Churchgate. Alternatively, you can put an online order for either of these publications from Flipkart or Amazon for local delivery while you’re here, which you should get in a couple of days after placing the order. You are of course free to join on any of our birdwalks while you’re here, which we usually hold every Sunday. You can join the Facebook group for which the link has been provided above to stay updated. Cheers.